With over 3,000 years of history, Xi'an (西安) is often referred to as the birthplace of Chinese civilisation. As the oldest surviving capital of ancient China, the city is home to a collection of influential historical monuments, ancient ruins and heritage sites that continue to attract and enthral tourists and locals alike. 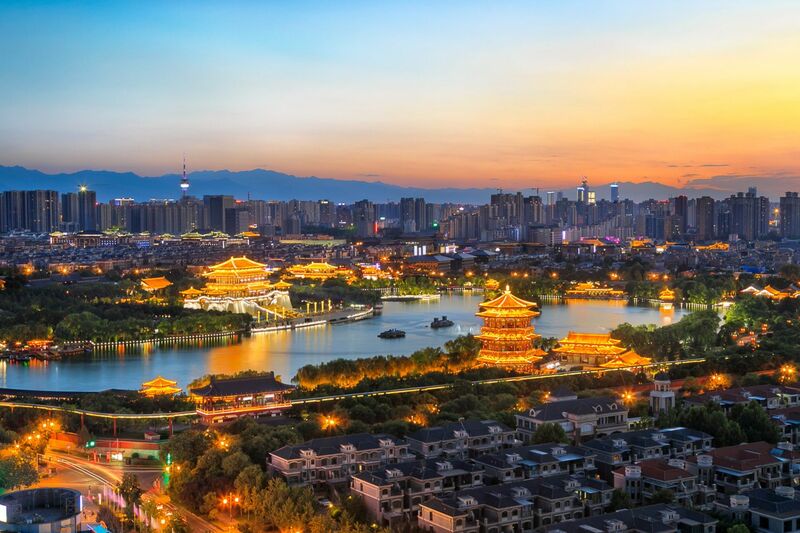 Influenced by its location at the eastern terminus of the famed Silk Road where traders around Asia crossed path, modern-day Xi'an is now a cosmopolitan city with a melting pot of cultures and cuisine. Located in the heart of historical Xi'an, Grand Park Xi'an boasts an impressive façade evoking the grandeur of an ancient palace. Enjoy convenient access to major shopping malls and world-renowned scenic spots like the Bell Tower and City Wall, which within walking distance from the hotel. Explore top attractions in Xi'an via public transport with Yongningmen Subway Station (Line 2) metro station just a 2-minute walk away. Overlooking the majestic City Wall, this 5-star luxury hotel’s contemporary guest rooms offer picturesque views and relaxing space to kickstart a cultural adventure. Noodles are a basic staple food in Chinese cuisine and visitors flock to Xi'an for Biang Biang Mian. Originating from Xi'an, this hand-made broad noodle mixed with chilli oil became popular only because of its addictive taste, but also for having the most complex Chinese character in its name with a total of 58 strokes. The Chinese equivalent of a hamburger, Roujiamo (肉夹馍) is filling and flavourful. Typically stewed for hours with more than 20 herbs and spices, the braised meat is then placed in between two pieces of crispy Baiji bread to form one of China’s most well-known street snack. Grand Park Xian's signature Peking Duck. Every city has a signature local dish. In Xi'an, Yang Rou Pao Mo 羊肉泡饃 is deeply loved by both locals and tourists for being a nourishing meal of crumbled flatbread soaked in savoury mutton gravy that is perfect for cold weather! Enjoy authentic Cantonese delicacies and Shaanxi delights that inspire the senses with rich local flavours, textures and tastes at Park Palace. Known for their signature roast duck, don't miss a taste of glistening crispy skin and tender meat baked in hours over burning wood. Xi'an City Wall, the best-preserved city walls in China. A trip to Xi'an isn’t complete without a visit to the Terracotta Army Museum. Listed as a UNESCO World Heritage Site and often called the Eighth Wonder of The World, stand in awe of more than 7,000 Terracotta figures that were sculpted during the Qin dynasty to protect the tomb of China's first Emperor Qin Shi Huang. Step into a portal of the past at this iconic military fortress that was built in 1370 during the Ming dynasty to protect Xi'an. Take a long stroll or hop on a bike to explore one of the oldest and best-preserved city walls in China. Appreciate the history and signifance of the landmark and take this chance to capture some of the best views of the Xi'an. Muslim Quarter, a lively neighbourhood in Xi'an. Originally built in the Tang dynasty, this well-preserved UNESCO Heritage Site is known for its vast collection of Buddhist sutras and figurines. Climb up 7 stories of wooden stairs to admire scenic views of the city from above. Come nightfall, don’t miss the captivating light and water show at the largest musical fountain in Asia located right in front of the pagoda. A lively and colourful neighbourhood that also houses a large enclave of Muslim community in Xi'an, the Muslim Quarter is a great place to spend an evening. Wander down narrow paved roads to taste some of Xi'an’s distinctive street snacks, purchase unique souvenirs, watch cultural performances and interact friendly locals. Beyond the world-famous Terracotta Warriors, Xi'an is a captivating city with plenty to see, do and eat. Travel in and around the city with ease with convenient public transportation access and a railway hub that connects to Northwest and Southwest cities in China. Enjoy four distinct seasons from beautiful cherry blossoms in spring to snow-capped landscapes in winter. With its fascinating history and delicious local food, explore and experience what Xi'an has to offer in the heart of China.